Dennis Kucinich’s hearing on the legality of the Yankees stadium project may be only days away, but apparently the Internal Revenue Service waits for no man. The T-men have already finalized their long-awaited new regulations (PDF here) governing the use of tax-exempt bonds for development projects, and the Yankees appear to have come up winners, while for the Nets and their Atlantic Yards project, the consequences are less clear. The story so far: Back in 2006, Mayor Bloomberg and the Yanks’ owners put forward a plan to make the team’s $1-billion-or-so stadium project eligible for tax-exempt bonds, which are normally not allowed for private projects. The trick? Even though the Steinbrenner clan will be paying for all construction costs for the stadium itself (the city gets to pay for a few hundred million in exciting stuff like underpasses and sewer lines), they’re calling those expenses “payments in lieu of property taxes” (PILOTs) in order to meet the feds’ requirement that tax-free bonds be paid for with public tax revenues. (The Mets used a similar scheme for Citi Field.) While many tax experts looked askance at the dodge, the IRS (after lobbying by Charles Rangel) okayed it, and the Yanks broke ground a few weeks later. Since then, the Yankees have asked for another $350 million in tax-free bonds (to pay for, among other things, a snazzier scoreboard), while Nets owner Bruce Ratner has proposed floating $800 million in tax-exempt bonds for his planned Brooklyn arena via the same PILOT dodge. The IRS, however, has spent the last two years trying to concoct new regulations that would reconcile the PILOT scheme with existing law. The new regs provide “broader flexibility for phased adjustments to PILOTs during the development, construction, or initial start-up period of the property.” This could be used to justify the Yanks’ use of additional bonds under the same rules as they got in 2006, as an “adjustment” of their previous PILOTs. In any case, none of this affects the questions raised about whether New York City cooked the books on the Yankees’ land valuation, which could make their whole PILOT scheme illegal under either the old or new IRS regs. It should make for quite the hearing on Friday – tune in on the committee website for the webcast, or on the Voice website for my live-blogging of the proceedings, if I can get the technology working. I have to say, I really can’t stand Kucinich, this is the guy who bankrupted Cleveland while he was mayor, so he knows little (If anything) about economics, and he strikes me as nothing more than an opportunist, who sees the chance to bash the Yankees and the City (If there is something ILLEGAL going on, than give the information to a prosecutor, let him make the decision, to prosecute or not, and shut up, and let the legal system run its course). As for the funding issue, the Yankee Stadium, Citi Field and Atlantic Yards issue are exactly the same. You have a small number of people who will do anything to prevent progress, and certain politicians who play into that. Groups like Willets Point land owners, greedy Luddites that they are, who pollute the environment, and have Willets Point Blvd look like the streets of Calcutta, are beyond description. Other groups such as “Develop Don’t Destroy Brooklyn”, although not quite that bad, have failed to come up with a REAL ALTERNATIVE to Atlantic Yards. (Stuff like 100% Public Housing is not going to happen, unless the City & State take over not only all of Ratner’s Land, but Daniel Goldstein’s condo as well (Good luck to that)). Where is the DEVELOP coming from in the name “Develop Don’t Destroy Brooklyn”? It is probably limited to Brooklyn MICHIGAN. 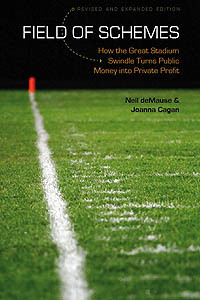 Finally, there is no question that public spending on sports facilities is over (The economics, IRS Rules, and Political Issues are among the reasons why this is occuring). Maybe Atlantic Yards, a new Nassau Coliseum, and a Miami Stadium for the Marlins get complete, but that will likely be the end for at least another five years. There are two questions that still remain: 1: If there is no spending on sports facilities, how do eyesores like the Vanderbilt Ave Yards, the former Orange Bowl, and Willets Point get cleaned up? 2: Assuming that a cleanup is necessary (In the case of Willets Point, few rational people doubt it (They just disagree on how to do it)). What will take the sports facilities place (If anything?). David Brown you are so right welcome to my club. The atlantic yards will get built also. Ithink they will do something with vanderbuilt yards or willets point sports related can Idare say a football stadium to get a nfl team to new york. Why in the world is building a stadium full of superboxes equal to “progress”? There is nothing wrong with Yankee Stadium, Shea, the Meadowlands, or anywhere else. Why is the public responsible for “revenue streams”? Especially for the NBA–yesterday’s sport if there ever was one. More importantly, why can Abe Pollin build his own arena in DC, Magowan his own stadium in San Francisco, and the Red Sox seem to last in 97 year old Fenway Park without massive public subsidy? Brooklyn has radically changed, for the better, in the last 20 years with no Brooklyn Dodgers. Maybe its up to you clowns to explain how that happened.